Liverpool goalkeeper Scott Carson has gone on loan to Charlton until the end of the season. The 20-year-old was England's third goalkeeper at the World Cup and is currently with the U21 squad. 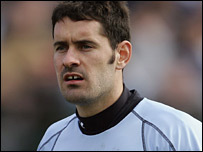 Last month the former Leeds goalkeeper extended his contract at Anfield by two years until 2011. He had a loan spell at Sheffield Wednesday last season and was called up to England's World Cup squad after injury ruled out Robert Green. Carson becomes Liverpool's second England squad goalkeeper to go out on loan. Chris Kirkland, who is part of the senior England squad preparing for Wednesday's friendly against Greece, is currently on loan at Wigan.